The Florida volleyball team got back on track Sunday with a win that put them among elite company. 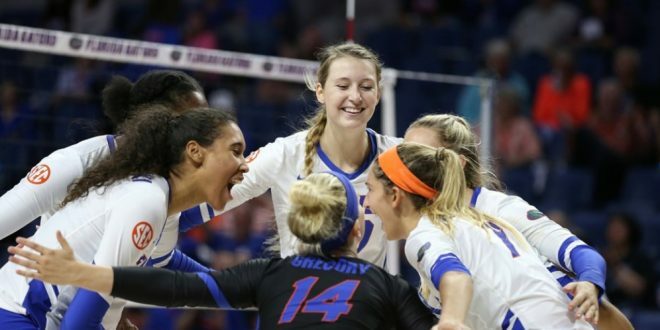 The 11th ranked Florida Gators (20-5, 11-2) rebounded from being swept on the road by 12th ranked Kentucky as they took down the Arkansas Razorbacks (10-12, 4-8) 3-1 in a Sunday afternoon home match. After dropping the match’s first set, the Gators responded by taking the next three frames to earn the victory. “It feels like the forever since we’ve played last so it was good to come back to the O-Dome and really find our rhythm,” senior setter Allie Monserez said. The Gators started the match hitting .194 and allowed the Razorback to hit .263. Florida tied the set twice, but two Arkansas runs had them down 1-0 to begin the day. But Mary Wise’s squad would turn it on for the next three sets. They went on to hit .542, .407 and .333 as a team in sets 2, 3 and 4. Paige Hammons led the way with a career-best 16 kills; her previous best was 13 against the Georgia Bulldogs. Hammons was productive in almost every facet with four service aces, 10 digs and four blocks. She said the Gators found motivation internally. Those seniors brought their own production as well. Kellum was second on the team in kills with 12 and no errors for .632 hitting percentage along with seven blocks. Allie Monserez spread the ball all around the court as she tallied 44 assists and even provided two service aces. Middle blocker Rachael Kramer and outside hitter Mia Sokolowski threw their hats into the ring too. Both had 10 kills in the match. Florida joined the ranks of Nebraska and Penn State on Sunday as programs since 1984 that have won their 1,000th program win. Mary Wise is responsible for 844 of those wins and Hammons said it was great to earn something like that with the squad they have. The Gators will look to make 1,001 this Sunday in an afternoon road match against the Auburn Tigers.